CENTRIA, an industry leader in the design, development and manufacturer of architectural metal wall and roof systems, is proud to announce the addition of zinc, by VMZINC, for use as a material substrate in its Profile Series® Concept Series and IW Series. CENTRIA now offers Zinc from VMZINC for Concept Series and IW Series. Zinc has been used in architectural applications for more than 200 years. CENTRIA, an industry leader in the design, development and manufacture of architectural metal wall and roof systems, is proud to announce the addition of zinc, by VMZINC, for use as a material substrate in its [Profile Series® Concept Series and IW Series. The new zinc panels will be available in a 1mm (.039 inches) thickness, provided by VMZINC, with a smooth, non-embossed finish. The panels will be available in five pre-weathered zinc colors from VMZINC, including QUARTZ-ZINC® - Grey, ANTHRA-ZINC® - Black and PIGMENTO® - Red, Blue and Green. 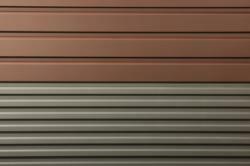 For more information about zinc panels, call 800.759.7474 or email info@CENTRIA.com. CENTRIA innovations in architectural metal wall and roof systems are helping building teams around the world reimagine the building envelope. From inspiration through installation, CENTRIA provides the highest level of expertise including service and support from an elite Dealer Network. Based in Pittsburgh (Moon Township, Pa.), our metal architectural systems are the perfect combination of science and aesthetics, offering advanced thermal and moisture protection, the broadest spectrum of design options, truly integrated components, and superior sustainability. We invite you to explore the limitless possibilities metal provides for your next project and to reimagine metal at http://www.CENTRIA.com/ReimagineMetal or find us on Facebook. Umicore Building Products is a world-leading producer of architectural zinc. For over 160 years, Umicore has been providing innovative solutions for building owners, architects and contractors. Umicore has offices and representatives all over the world. In the United States, Umicore Building Products USA, Inc., is based in Raleigh, NC. For additional information, visit http://www.vmzinc-us.com. VMZINC also maintains the blog ZINCsense (http://www.zincsense.com) and an active Facebook page.